Sentinel 3 is part of ESA’s earth observation and monitoring programme, helping track the impact of global warming and climate change. The Engineer got up close and personal with the first satellite, due to launch in December. Sentinel 3A will take measurements from both land and sea. Monitoring the state of our planet has never been more important. Scientific consensus has been established on the veracity of global warming, and a greater need to observe, record and respond to its effects. As technology has progressed, so too has our ability to monitor the planet’s climate, with increasingly advanced satellites feeding data back to Earth. Though the results can often be depressing, their accuracy is vital to scientific research, the global economy and even our fundamental safety and existence. Earlier this week in the balmy surrounds of Cannes in the south of France, I got a chance to see first hand the latest European satellite that will help expand our knowledge on the health of the planet. 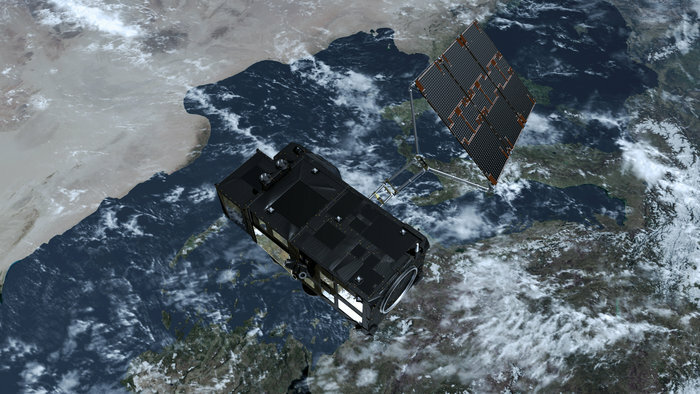 Sentinel 3A is part of the €4.3 billion Copernicus project – the EU’s Earth observation and monitoring programme. Using a range of instruments, it will measure sea and land temperature and colour, as well as sea topography, providing accurate data with a wide range of applications. Due to launch from outside Moscow on December 10, 3A should be fully operational about halfway through 2016. 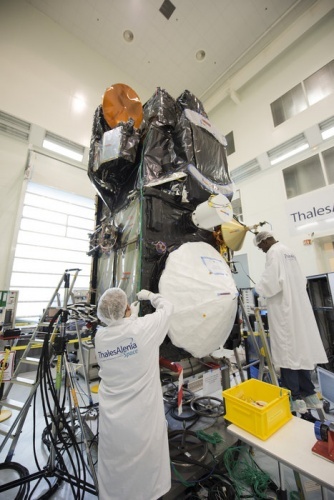 The Sentinel 3 programme is overseen by the European Space Agency (ESA), and will ultimately see four satellites manufactured in Cannes by Thales Alenia Space. Sentinel 3B will follow A into orbit 18 months later, with C and D replacing the pair at the end of their service in the 2020s. The projected lifespan of each satellite is 7.5 years, but it’s hoped that they may last as long as 12, and will be fuelled accordingly. In the cleanroom in Cannes, the engineers and scientists were putting the finishing touches on 3-A before its move to the Russian launch site. Weighing about 1250kg and with dimensions of around 4m X 2m X 2m, the £350 million satellite is roughly the size of a minivan. Its radiometer, spectrometer, and altimeter instrumentation are all located on its Earth-facing front, along with antennas for relaying data and manoeuvring the satellite in its orbit around the poles. The solar array will unfold from the back once in space, delivering power to the on-board equipment. Scientists and engineers work on Sentinel 3A in the cleanroom. Having been in development for eight years, there was obvious pride on display at reaching this crucial stage in the project’s life. After all the planning and toil, Sentinel 3A will soon be relaying vital climate data back to Earth, finally fulfilling its purpose. This is, of course, when the huge financial investment begins to pay off. EUMETSAT, the European agency that will operate the Sentinel-3A satellite after launch, provides near real-time access to the marine data while ESA will distribute the land data to users. Perhaps more excitingly, all data is free to access via the project website within three hours, opening up downstream applications to other users, be they businesses, researchers or amateur climatologists. The open data project exists across the entire Sentinel programme, and has seen considerable success with data from earlier satellites. Almost 12,000 users have registered for access over the past two years, with over 2 million images downloaded to date. All these extra eyes on the planet certainly won’t halt the march of global warming, but perhaps they can help draw wider attention to the climate changes Earth is undergoing. With the Paris talks just around the corner, the planet needs all the help it can get. The Engineer does climate science again? I would have thought your reader’s comments would give you pause for thought before trotting out the usual warmist mantra. Great report, Andrew. I have been watching the Copernicus program, but did not notice that this will be an open data project, thank you for pointing that out. We created the problem, we will solve it, the problem being anthropogenic climate change. This project is an exceptional tool for solving the problem fast, through global, open collaboration. It should be in a great position to measure the greening of the planet and increasing crop yields as a result of higher levels of CO2. Monitoring Earth’s climate is undoubtedly a good program. But can it help reduce global warming and depletion of ozone layer? Definitely not. Emissions from industrial chimneys, cars, planes and other machinery are the main culprits contributing to the global warming. We should think about how to reduce/eliminate these emissions to save our earth from destruction. Anonymous (10:03) well said I am in total agreement. This is quite an interesting read from an AGW convert. I am also happy that this is an open data project which will reduce the possibility of data manipulation. Improved research tools are to be welcomed. It is almost amusing that the satellites are being linked to research on global warming when it is the existing satellites that have proved that there has been no real global warming for 18 years: only “humangenised” data manipulation by NASA / NOAA and the UK Met office. I have had several “blog-ups” with Sylvia, who is a hardened “believer” and suggest, as others have done, that she looks at the long term UK weather trends and tries to identify any significant recent change in the UK weather since these started over 200 years ago: climate is weather integrated over an indeterminate period. However the Paris CoP 21 is drawing near and the press hysteria is being whipped-up wherever possible to finally kill-off our large power using industry on the altar of a non-existent climate problem : steel has already gone to the wall! Apologies to Silvia that I mis-spelled her name in my recent correspondence. I did miss one point that is important to future science and that is the farcical situation where UK met-office data are only available for fees and much of the published matter and data collected by so-called climate scientists is kept away from criticism. The free availability of data from this satellite will be a great benefit. We are all believers: some in facts, others in myths. As an engineer, I belong to the former crowd. Plus I take my cues from Ben & Jerry’s. As they say: “If it’s melted, it’s ruined”. So let’s save it for all of us, deniers included. I had a look at the two websites you linked. The OSS one was reasonable in the what we know and what is not certain areas. There is an obvious Jim Hansen influence as he has to defend the stand he made before the US Congress. What is not there (maybe because it is fact not myth) is any form of explanation for the current status. “The rate of warming over the past 15 years (1998-2012; 0.05°C/decade) has been smaller than since 1951 (0.12°C/decade)” On the same page the graphs clearly show the actual temperature about to fall below the lowest predicted range. At the same time the Keeling series (Mauna Loa CO2 measurements) show a steady and consistent increase during this time of around 1.6 ppm per year. Manipulate the numbers so the current “pause” does not exist. 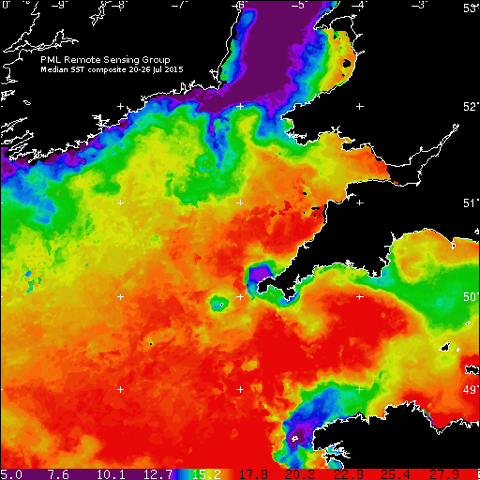 Saying that the heat is still going into the oceans without an explanation of what has caused this mode change. You are a factual engineer, what is your explanation? The UCS one is rather sensational but amused me as it contains the attack on Dr. Soon’s finances but ignores the current investigation into Prof. Jagadish Shukla’s Institute of Global Environment and Society (IGES). For those who aren’t aware Prof. Shukla was the lead signatory of a letter suggesting that the USA’s anti-racketeering legislation (RICO) should be used against those who do not support global warming. So how factual is this website, or does it just agree with your views? 1. I cannot imagine a non-factual engineer, but if he or she exists, they should move into something else, I don’t know: economics, storytelling, fiction, magic? In what type of arithmetic are these numbers smaller? 2. Nobody cares about Dr. Soon’s finances, but he had an obligation to disclose all the funding for his published research and he didn’t. He is a salesman, not a scientist, a salesman of fossil fuel funded climate denial. 3. Jim Hansen is a leading climate scientist. He does not have to defend anything to Congress. Congress needs to be more scientifically literate, much more. Too many members would not pass an 8th grade science test in general, let alone a climate science one. Now back to solutions, from the useless debate. Next time though, now I have to jump in my city shared EV and drive around generating zero pollution and doing my part to reverse anthropogenic climate change. When did you leave the real world. You deny the drop in the rate of global warning which even the IPCC accept and then attempt to justify this denial with the set of numbers that the drop is based on. Try drawing some graphs. Where about in the world are you? Possibly in Switzerland, where in spite of the best efforts of the greens, electricity is generated by nuclear and hydro you might be able to say that your EV generates zero pollution. Almost everywhere else you are merely moving the pollution somewhere else and wasting more energy in transmission and charge/discharge losses. First, do not call me dear. It is sexist and paternalistic. I want women to go into and stay in STEM (see all the articles in the Engineer and elsewhere on why this is a big problem) and not be worried about being “patted over their head”. Second, I am American and live in the US. If my electricity is non-clean I offset it 100% with REC’s, so there, I can be super-green and I am, like many other Americans in every state. Third, I cannot help you read numbers. Fourth, the ten warmest years on record have all happened since 1998. My ‘oh dear’ at the start was an expression of despair at how deeply you have been sucked in by all the hype. I am sorry that you misinterpreted it and I agree entirely with you regarding women in STEM. RECs are another part of the hype, they often make more money for the rich rather than reducing pollution although with careful study you may get some benefits. Thank you for the NASA graph, the red 5 year mean line nicely displays the current reduction in the rate of global temperature increase which you deny exists. As the Earth is still warming after the recent little ice age, global temperatures are expected to be rising so it is reasonable that the warmest years in the last century or so were since 1998. The problem here is ‘record’ The longest actual temperature record that exist is the Central England Temperatures that goes back to 1772. If you look at longer term proxy records, such as ice cores the picture is rather different. The current period is still rather cool compared to the last few thousand years! If you don’t like the graphs the actual data sets are referenced at the end of the document so you can draw your own.